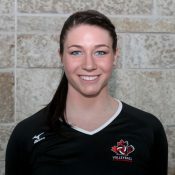 Michaela Reesor was born and raised in Ontario, and started playing volleyball in grade six. She soon fell in love with the sport and began playing at a high level. Michaela won the U18 Canadian National Championship in 2011, and after graduating from Mayfield Secondary School the same year, began her career with Samford University. With Samford, Michaela won the Southern Conference Championship twice: in 2011 and again in 2014. She was named to the SoCon All-Freshman Team and chosen as SoCon Freshman player of the week twice in 2011. The next year, she led her team in kills. In 2013, Michaela was named SoCon Player of the Year. Her senior year, Michaela was team captain and became first in all-time kills and attacks. Throughout her career, Michaela started in all but one game with Samford, all while staying serious about her studies and taking part in several extracurricular school committees. In 2015, Michaela graduated from Samford with a bachelor’s degree in public relations and advertising, and was chosen as an NCAA Top 30 Woman of the Year honouree. Currently Michaela is playing volleyball and pursuing her master’s degree in business administration at the University of Alabama at Birmingham (UAB). She is a member of Canada’s Women’s National Volleyball Team.